The federal agency responsible for caring for unaccompanied alien children is pushing back against accusations that it has lost nearly 1,500 of them, knocking critics that “confuse and spread misinformation” about the issue. Most of the children were not lost, but were temporarily unaccounted for because their sponsors did not respond to inquiries from government officials, Department of Health and Human Services Deputy Secretary Eric Hargan said in a statement released Monday. Hargan was responding to a recent spate of reports that the Office of Refugee Resettlement—the HHS sub-agency that places unaccompanied alien children with relatives or other sponsors in the U.S.—lost track of 1,475 migrant children during a three-month period in 2017. In recent weeks, coverage of the unaccompanied minor problem has intensified in light of the Trump administration’s policy of separating some illegal immigrant families at the southwest border, though they are two distinct issues. 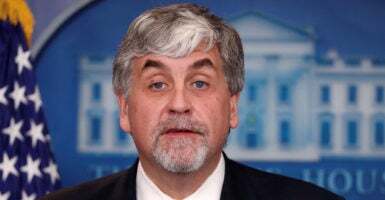 The most recent round of media attention homed in on a bit of testimony that Steven Wagner, the acting head of HHS’ Administration for Children and Families, gave to Congress in April. Wagner told lawmakers that the Office of Refugee Resettlement had contacted 7,635 unaccompanied alien children and their sponsors between October and December 2017, but was unable to “determine with certainty” the whereabouts of 1,475 of them. Wagner’s testimony also included data about steadily rising levels of illegal immigration by unaccompanied minors and people traveling in family units. Immigration authorities referred 40,810 children to the Office of Refugee Resettlement in all of fiscal year 2017, but in the first six months of fiscal 2018, HHS has had 21,574 referrals, putting it on pace for a 6 percent increase. After slowing to a trickle in the early months of the Trump administration, monthly unaccompanied alien children referrals are approaching levels last seen during the Central American migrant crisis of the Obama administration’s last three years. HHS received 755 unaccompanied alien children referrals in March 2017, compared to 4,205 in March of this year—a 450 percent year-over-year increase. Wagner hit back at critics on Monday, saying that the Office of Refugee Resettlement was not designed to be a long-term guardian for illegal immigrant children. “It was never intended to be a foster care system with more than 10,000 children in custody at an immediate cost to the federal taxpayer of over $1 billion per year,” he said, according to CNN.